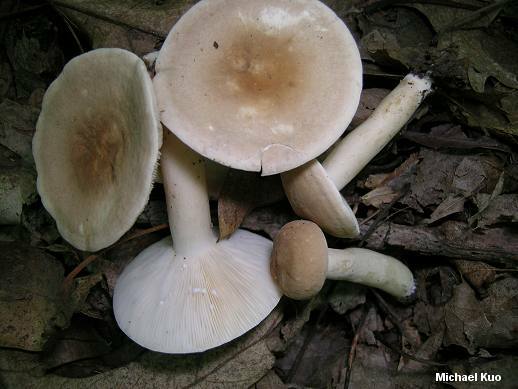 Here is a common summer species of Lactarius in eastern North America, recognized by its smoky brown cap, its long stem, and the fact that its gills and flesh stain pink to reddish when damaged. It is very variable in several of the features that are supposed to define it, including taste (putatively acrid but often perfectly mild), color (sometimes nearly white), staining (usually to pink but sometimes not staining), and microscopic features (see below)--which means that until you have collected it several times it can be quite baffling, identification-wise. 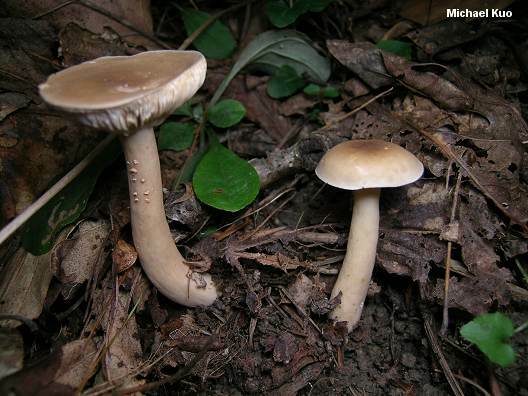 Similar species include Lactarius subvernalis var. 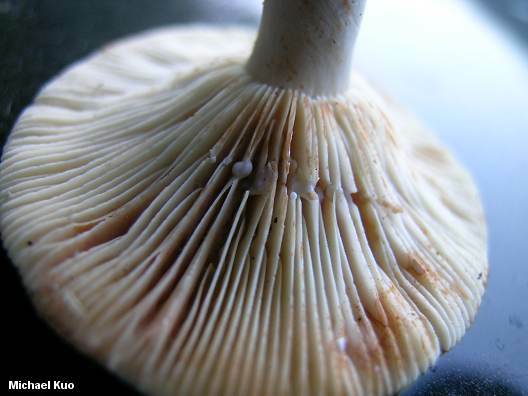 cokeri, which is usually white and usually smaller, and Lactarius subplinthogalus, which has very distant gills and a frequently scalloped cap margin. Hesler & Smith (1979) describe Lactarius fumosus var. fumosoides from boreal ecosystems, with gills that run down the stem and a pileipellis that contains more inflated elements. Ecology: Mycorrhizal with hardwoods and conifers; growing alone, scattered, or gregariously; summer and fall; widely distributed in eastern North America. Cap: 3-10 cm; at first broadly convex, becoming flat or shallowly depressed; dry; fairly smooth; dull smoky brown or paler (occasionally nearly whitish); the margin even. 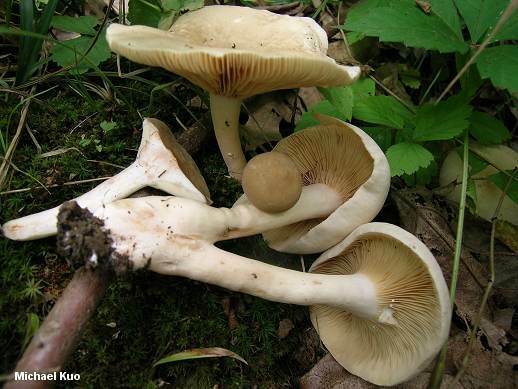 Gills: Attached to the stem or beginning to run down it; close or crowded; white, becoming pale brownish with age; when fresh staining pink to reddish when sliced. Stem: 4-11 cm long; up to 1.5 cm thick; more or less equal; smooth, without potholes; colored like the cap or paler; often whitish near the base; usually bruising slowly pinkish to reddish. Flesh: Whitish; usually staining pink to reddish on exposure, at least over time, but occasionally not staining (especially in dry, hot weather). Milk: White; unchanging; usually staining tissues pink to reddish. Odor and Taste: Odor not distinctive; taste variable, ranging from acrid (sometimes slowly) or peppery to mild. Spore Print: Pale cream to buff. 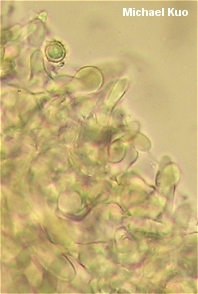 Microscopic Features: Spores 6-8 µ; globose or subglobose; ornamentation 0.5-1.5 µ high, as spines and ridges forming broken to nearly complete reticula. Pleuromacrocystidia absent. 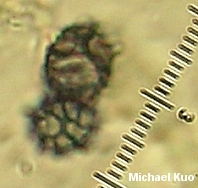 Cheilomacrocystidia usually inconspicuous but occasionally conspicuous; subcylindric to subfusiform; to about 40 µ long. Pileipellis a trichoepithelium or, in young caps, nearly a trichoderm. REFERENCES: Peck, 1872. (Saccardo, 1887 [fuliginosus var. fumosus]; Hesler & Smith, 1979; Smith, Smith & Weber, 1979; Phillips, 1991/2005; McNeil, 2006.) Herb. Kuo 06199604, 07240401, 09300406, 07200707, 07090805.